To give the space a glamorous dressing-room vibe, Rollins designed brass hanging rods at one height around the perimeter of the space. 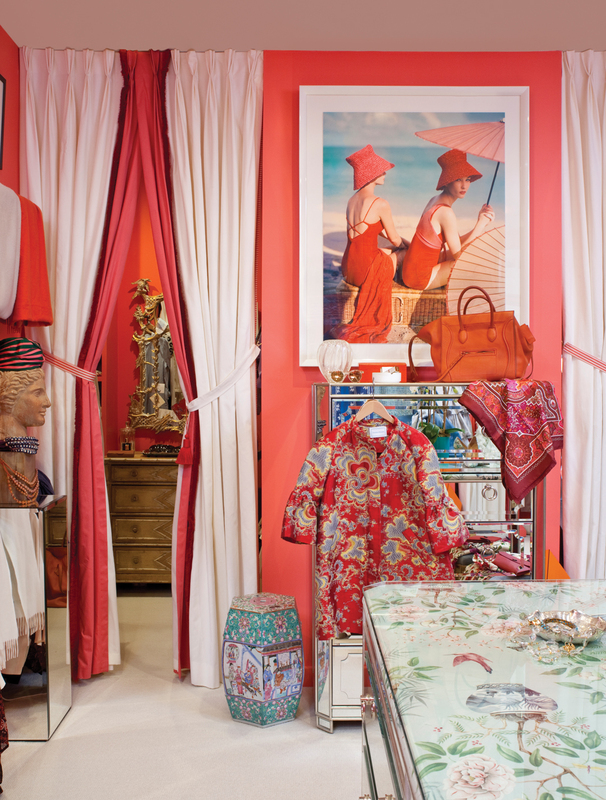 The chinoiserie casepiece, found secondhand in Palm Beach, was lacquered to match the walls in a coral hue inspired by a discontinued Estée Lauder lipstick, “Princess Grace,” matched by Benjamin Moore. It holds her casual clothing, jeans, and sweaters, while two mirrored dressers arranged back to back create a centerpiece for accessories, topped with plywood upholstered in leftover fabric and cut glass. Rollins found the faux bamboo and wicker chandelier at Scott Antique Markets and had it rewired. 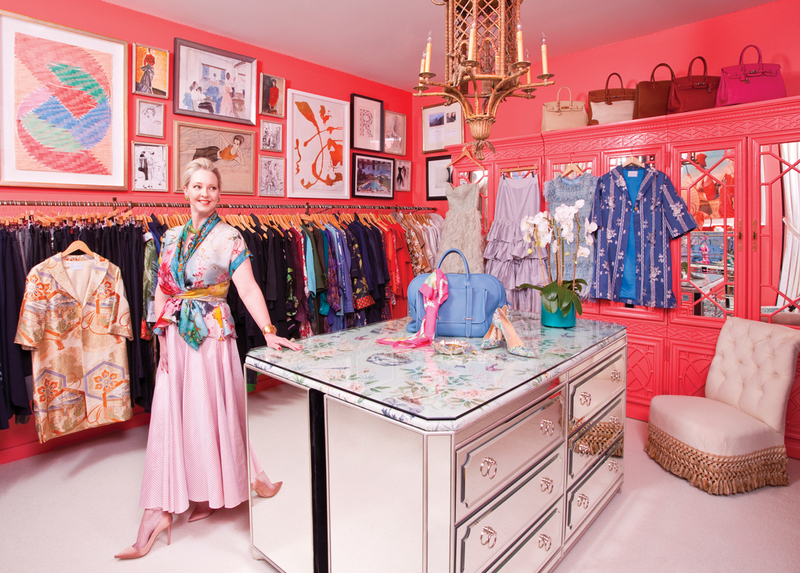 Hermès, vintage Céline, YSL, Oscar de la Renta, and the designer’s own pieces—silk damask jackets, Liberty print ball skirts, and patterned caftans—are arranged first by type and then by color. Her capsule collection can be shopped at danielledrollins.com. An adjacent galley closet creates a home for shoes, stored by heel height and color, with boots on the bottom. Drapery—made with plain ivory canvas and a pink Scalamandré gingham lining Rollins saved from her daughter’s nursery (she’s now 19)—creates the feel of a luxe alcove. The Algot system pieces start at $48, and the Elvarli unit runs $740. “Customize” sections with the online space planner. Crafty types might elevate the Pax wardrobe with trim, paint, and hardware. The adjustable steel Elfa system starts at $195. Custom builds, with eight finish options and luxe hardware, start at $500 and can go up to $66,000 for a walk-in. Projects from these custom pros start around $1,000, and they are known for outfitting dream dressing rooms with specialty countertops, tailored nooks, and fine finishes. This Marietta company offers 30-plus colors and 14 cabinet styles—more than 2,100 options. A 10-foot closet wall starts at $1,000.